Pssst, if you are a gmail subscriber, don't forget to drag this message to your primary tab to stay in the know. Celebrate those who provide assistance to people living with ALS. November is National Family Caregivers Month. Nationwide, more than 65 million individuals are family caregivers to those with physical, developmental or emotional needs. This month, The ALS Association thanks the many dedicated caregivers who provide crucial support to loved ones living with the devastating effects of Lou Gehrig's Disease. Caregivers encounter many challenges in dealing with ALS, some of which include the new experience of providing assistance to those developing physical limitations affecting mobility, swallowing, speaking and breathing. An ALS diagnosis impacts every aspect of caregivers’ lives as they adjust their efforts to meet ongoing work, family, personal and financial obligations, which change as this disease progresses. To support caregivers, we offer helpful resources on our website. Additionally, there will soon be an ALS Association hosted webinar on November 18 for caregivers on how they can benefit from assistive technology. We will also offer individuals the opportunity to thank a caregiver through an online e-card. People can create customized messages to send via email to the caregiver in their lives who has chosen to fill this vital role. For each e-card sent, Permobil, the world’s leading manufacturer of power wheelchairs, will donate $10 with a $25,000 maximum donation. So please join us this month in celebrating those who are dedicated to caring for people living with this disease. ALS Association chapters continued their partnerships with Major and Minor League Baseball teams around the U.S. to spread ALS awareness to the game’s tens of millions of fans, including awareness of the National ALS Registry and the connection between ALS and military service. These were major themes of the more than 30 events that chapters held with professional baseball teams this season. Some chapters saw their names on stadium Jumbotrons, while others spread the word by participating in game day television and radio broadcasts..
Veterans Day is Monday, November 11, and The ALS Association once again is launching a letter-to-the-editor campaign to raise awareness of our cause and the impact ALS has on our military heroes. We encourage everyone to participate. Simply go to the Advocacy Action Center of our website, personalize the sample letter that is available and send it to your local papers directly from the website. It takes just a few minutes to send the letter, but it can raise awareness of ALS across the country and build support for our cause. In addition to the letter-to-the-editor, please visit the Wall of Honor, which can be found on our website. See the faces of veterans with ALS and read their stories of courage. If you know a veteran with ALS or a veteran who has been lost to ALS, help tell their story by sharing it on the Wall. And don’t forget to tell others and help us spread the word about this disease and its impact on our military heroes. Each person battling ALS is a hero. Family, friends, and all those who observe the way ALS patients fight this disease witness their courage, resolve, and dignity. You can help by telling your loved one about the National ALS Registry. 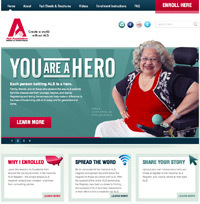 Check out our brand new website dedicated to the National ALS Registry at http://registry.alsa.org. Learn from people with ALS themselves about why they enrolled in the National ALS Registry. Learn more about the National ALS Registry today, and find out how this research can help, including by informing people living with ALS about new and ongoing clinical trials. Visit http://registry.alsa.org for more info. In work supported by The ALS Association and published in the Proceedings of the American Academy of Science, researchers showed that reducing the production of an ALS-causing gene mutation in mice is safe over the long term. This provides support for moving this therapy forward in people with ALS, whose disease is caused by mutations in this gene, called C9orf72. “These results are very encouraging for the field, as we develop new approaches to ALS therapy based on specific gene defects,” said Lucie Bruijn, Ph.D., Chief Scientist for The Association. Read full story. “These studies provide important new insights into this gene,” said Lucie Bruijn, Ph.D., Chief Scientist for The Association. “By learning more about the all consequences of the mutation, we can look for multiple therapies to address them.” Read full story. There is now an additional way to make a tax-efficient gift to The ALS Association: an Individual Retirement Account (IRA) Charitable Rollover. Extended as part of the American Taxpayer Relief Act of 2012 (section 208), the IRA Charitable Rollover allows individuals age 70½ and older to make direct transfers totaling up to $100,000 per year to 501(c)(3) charities, such as The ALS Association, without counting the transfers as income for federal income tax purposes. Distributions must be made payable directly from the IRA custodian to The ALS Association You are not required to count the amount of the gift as income for federal income tax purposes. Thank you for considering the IRA Charitable Rollover as part of your giving to The ALS Association. Please feel free to contact us if you have any questions. Vision Express is a companion to The ALS Association's national publication, Vision Magazine.